Andy Dalton‘s thumb injury will end his season. The Bengals will place their starting quarterback on IR, Paul Dehner Jr. of the Cincinnati Enquirer reports (on Twitter). Cincinnati also claimed Tom Savage off waivers from the 49ers, per Dehner (on Twitter). Jeff Driskel, who took his first NFL snaps this season, will be in line to start the rest of the way for Cincinnati. This may deal a massive blow to the Bengals’ fleeting playoff hopes. Torn thumb ligaments will cause Dalton to venture to IR, Ian Rapoport of NFL.com reports (on Twitter). It’s not known if a surgery is scheduled, but that would be logical given the IR announcement. This malady forced Dalton out of the Bengals’ Week 12 loss, but it was initially reported the eighth-year quarterback did not suffer a break. Still, he will head to IR for the first time in his career. Dalton has missed just three games in his career — all in 2015, which crushed probably the best Bengals team in the past 30 years — and the Bengals did not invest much in a backup quarterback this offseason. A.J. McCarron departed via free agency, but the Bengals retained Driskel and essentially promoted him to QB2. The Bengals started out 4-1 but have lost five of their past six games. Dalton did not finish losses against the Saints and Browns, the former because of the nature of the game. He was enjoying a better season than he produced in 2017, throwing 21 touchdown passes and holding a 64.6 Total QBR — nearly 20 points better than his 2017 mark. Dalton had cooled off, though, since Cincy’s hot start, failing to eclipse 160 passing yards in three of his past five starts — the most recent such instance because of his injury. A.J. Green‘s absence had plenty to do with this, but while the Bengals’ top player may be ready to return in Week 13 against the Broncos, Driskel (36 career pass attempts) will be throwing him passes. Driskel began his college career at Florida before transferring to Louisiana Tech. He landed with the 49ers in 2016 as a UDFA. Savage spent parts of this season with the 49ers but was jettisoned multiple times, the most recent cut coming Saturday. He was the Texans’ opening day starter in 2017, but Deshaun Watson quickly replaced him. After Watson’s injury, Savage returned. He finished last season with 1,412 passing yards, five touchdown throws and six INTs. Just a day after cutting Tom Savage, the 49ers have brought back the veteran signal caller on a one-year deal, according to Matt Maiocco of NBC Sports (Twitter link). Room was made for Savage on the roster when running back Raheem Mostert and cornerback Emmanuel Moseley were placed on IR earlier today. Savage will presumably be the third-string quarterback behind second-year players Nick Mullens and C.J. Beathard. Mullens played well in his NFL debut last night, and coach Kyle Shanahan remains high on Beathard, so Savage won’t push for any playing time this season. That being said, San Francisco clearly wants something of a veteran presence in their very young and inexperienced quarterback room. It’s the third time this year Savage has been signed by the 49ers, as they’ve already done this release and re-sign routing twice. Savage was initially brought in for a workout and considered the favorite to sign in the wake of Jimmy Garoppolo‘s ACL tear, but it took a few weeks for the team to actually sign him. Savage opened 2017 as the Texans’ starter but was quickly benched for Deshaun Watson. 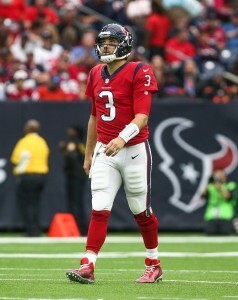 After Watson tore his ACL, Savage ended up starting a handful more games in Houston, and performed poorly. The 49ers have signed quarterback Tom Savage, per a club announcement. To make room, tight end Cole Wick has been released. The Niners have been seeking a third quarterback since losing Jimmy Garoppolo in September. They finally have one in Savage, though he’s a long way from seeing the field. For now, Savage is penciled in as the third-string signal caller behind C.J. Beathard and Nick Mullens. Savage was part of a QB contingent that worked out for the 49ers late last month, auditioning alongside Landry Jones, EJ Manuel, Kellen Clemens, T.J. Yates, Matt Simms, and Kyle Allen. Weeks later, he has landed a deal from SF. Savage inked a one-year, $1.5MM deal with the Saints earlier this year, and appeared to be the favorite to serve as Drew Brees‘ top backup, but he was cut after Teddy Bridgewater was acquired via trade. A fourth-round pick in 2014, Savage appeared in 13 games and made nine starts over four seasons with the Texans. Tom Savage To Eventually Sign With 49ers? Although the 49ers don’t plan to sign a quarterback this week after losing starter Jimmy Garoppolo to a torn ACL, veteran Tom Savage appears to be the favorite to eventually land in San Francisco, according to Mike Garafolo of NFL.com (Twitter link). Savage was part of a signal-caller contingent that worked out for the 49ers this week, as he joined Landry Jones, EJ Manuel, Kellen Clemens, T.J. Yates, Matt Simms, and Kyle Allen in auditioning for San Francisco. But the 49ers can’t afford to use an extra roster spot on quarterback this week, per Garafolo, so the club will hold off on adding a passer for now. Nick Mullens, a 2017 undrafted free agent out of Southern Miss, was promoted from San Francisco’s practice squad to serve as depth behind new starter C.J. Beathard. Savage, 28, inked a one-year, $1.5MM deal with the Saints earlier this year, and appeared to be the favorite to serve as Drew Brees‘ top backup. However, Savage was deemed expendable after New Orleans acquired fellow quarterback Teddy Bridgewater from the Jets, and Savage was subsequently released. A fourth-round pick in 2014, Savage appeared in 13 games and made nine starts over four seasons with the Texans. In the wake of Jimmy Garoppolo‘s ACL tear that will sideline him for the rest of the 2018 season, the 49ers are making moves to bolster their quarterback room, as the team will host a group of veteran signal callers according to head coach Kyle Shanahan (Twitter link via Nick Wagoner of ESPN). The quarterbacks coming in for workouts tomorrow include Tom Savage, T.J. Yates, and Kellen Clemens. Wagoner adds that Shanahan said Matt Moore is “another possibility” and that Nick Mullens would likely be activated from the practice squad. Shanahan has already said that the team won’t bring in any competition for C.J. Beathard, so any quarterback signed would be added solely as a backup to Beathard. Savage started seven games for the Texans last year, but found himself released by the Saints at final cuts after New Orleans traded for Teddy Bridgewater. Yates also most recently spent time with the Texans, starting three games for them last year. He’s bounced around the league as a spot starter, and even won a playoff game for the Texans a few years back. Clemens just recently saw his long tenure as backup to Philip Rivers come to an end when the Chargers decided not to re-sign him after the 2017 season. Clemens hasn’t seen meaningful action in a long time, as Rivers never missed a start during Clemens’ run with the Chargers. Overall, it’s not exactly an inspiring group. Beathard should have no trouble keeping the starting job the rest of the way assuming he can stay healthy, and it’s possible the team opts to just stick with Mullens as their backup. Mullens was an undrafted free agent in 2017 who has stuck around on San Francisco’s practice squad.